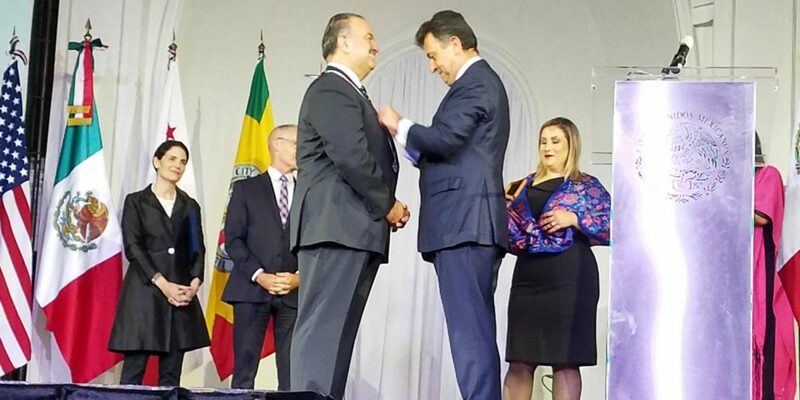 Mexico hands out esteemed civilian honor to LACCD Chancellor | Propel L.A.
Chancellor Francisco C. Rodriguez, Ph.D., of Propel L.A. Lead Partner, Los Angeles Community College District (LACCD), has received the Ohtli Award—or “Reconocimiento Ohtli”—from the Government of Mexico, one of the highest civilian honors it bestows, in recognition of his tireless advocacy of higher education to aid, empower or positively change the lives of tens of thousands of Mexican descendants or nationals in the United States. Chancellor Rodriguez joins a very exclusive list of other high-level community and education leaders, celebrities and sports legends who have also received the Ohtli Award, including, among others, Antonio Villaraigosa, (2010); Edward James Olmos, (2012); Fernando Valenzuela, (2014); Eva Longoria, (2015) and Gabriela Teissier, (2016). “Thank you very much to the Government of Mexico. This is a great honor to give to our Chancellor in recognition of the work he has done to advance the access of a quality college education to all at our District’s nine colleges. Congratulations to Chancellor Rodriguez,” said LACCD Board of Trustees President Mike Fong. LACCD educates the most undocumented students in all U.S. public higher education. In his acceptance speech, Chancellor Rodriguez focused on the District’s efforts to support undocumented and DACA students, and reaffirmed LACCD’s commitment as a place where all students can enroll and achieve their educational goals, regardless of their immigration status. 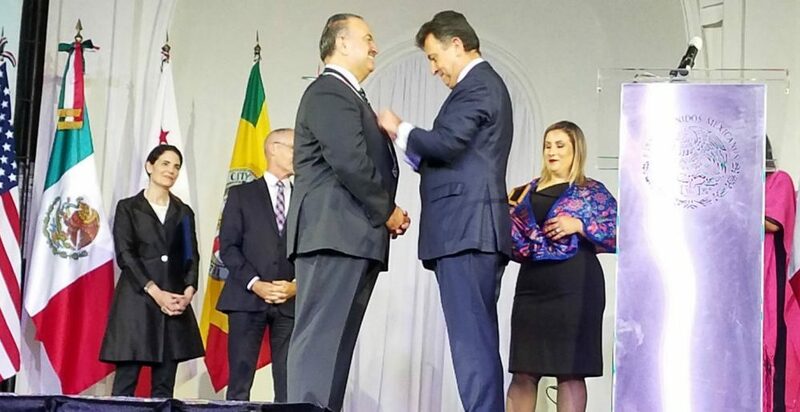 The Ohtli Award was presented on September 18, 2018 to Chancellor Rodriguez during a private diplomatic event in Los Angeles hosted by Mr. Carlos Garcia de Alba, Consul General of Mexico, as part of the 208th anniversary of Mexico’s Independence and “El Grito” Ceremony. The Ohtli Award is administered by the Government of Mexico and can be given annually by consulates of the government. The award includes a silver medallion and certificate. The name of the award comes from the “Nahuatl” word which means “road” or “path.” The medal depicts an Aztec god cutting grass with a machete, symbolizing the idea of opening a path for others.